A disappointing weekend for the Styleness Waratahs winning 1/4 grades against local rivals Gordon, with Second Grade having a frustrating draw due to a wet pitch and the overhead weather. Our Women’s T20 side had a great win on Saturday in their first T20, however were outplayed in their second game of their double-header against St George-Sutherland. First Grades below par total of 123 was chased down easily by Gordon four down before putting the Tahs back into bat. Ahillen Beadle putting on a batting masterclass finishing 101* to halt Gordon’s attempt at 10 points. Second Grade disappointingly drew due to a wet pitch forcing no play which affects their finals chances heading into the back end of the season. Third Grade won their 5th game on the trot, posting 214 on the back of Jacob O’Sullivan’s 116* before rolling the Stags for 159, pushing themselves into 4th place. Fourth Grades slide out of the top 6 continued, losing a match they probably should’ve won. Posting 174 on the back of Nick Cohen’s 67, the Tahs struggles with the ball, losing by one wicket with 6 overs to spare. Fifth Grade had a round to forget, being bowled out for 75 with only two batsmen reaching double figures and extras being the third highest scorer. Gordon chased it down with 20 overs to spare and six wickets in hand. The Women’s T20 side won game one on Saturday, posting 98 with Mia Waddington and Isabella Keene both posting 30, before restricting St Goerge-Sutherland to 74. Mia Waddington the pick of the bowlers taking 2/8 off her four overs. In game two, St George-Sutherland got their revenge, winning by 7 wickets chasing our 92. Sunday saw our Brewer Shield girls restrict Gordon to 91, with Gemma Lacey, Kate Salmon, Chloe Osborne and Robyn Medley all taking 2 wickets each. Unfortunately, our girls fell 8 runs short, being bowled out for 83, with Mia Waddington hitting 22. Overall, a disappointing weekend for the Tahs as we fall down the Club Championship ladder into 9th spot. Round 13 sees the Tahs tale on Randwick-Petersham back in the two-day format with all grades looking to move up their respective ladders. Go Manly! 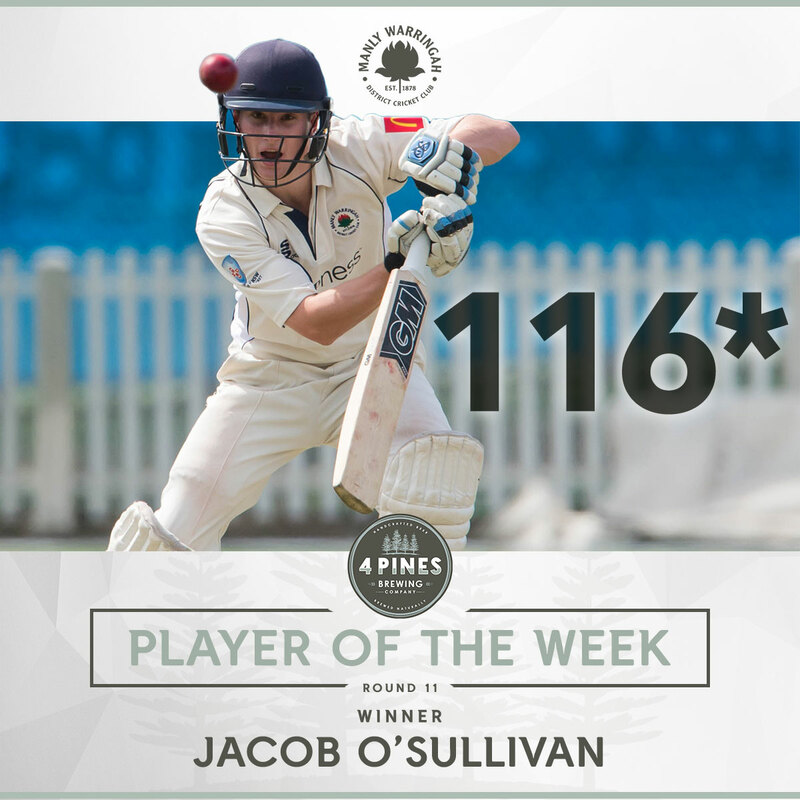 Young gun Jacob O’Sullivan is this weeks 4 Pines Player of the Week after crafting his way to 116* in Third Grades big win over local rivals Gordon. Entering the crease at 1/10, “Sully” combined with multiple batsmen to bat his way through the Tahs’ innings and help 3s post a competitive score. Sully batted with elegance and maturity to rotate the strike and punish the bad balls to the boundary. Sully additionally hit his very first grade six with a well-timed flick off his pads, showing his skills in the one-day format. Sul has been putting the hard yards in at training this season and it’s fantastic to see that his hard work is paying off. Hopefully a sign of things to come for Sully as he looks to guide 3s into the finals in the coming weeks. Congratulations Sul! The First Grade side showed up to a gloomy Manly Oval after some rain had settled in over the previous afternoon and having more expected throughout the day. The wicket though seemed the usual Manly wicket and after winning the toss new found celebrity skipper Mr Cameron Merchant decided we’d have first crack with the willow. Despite a dry spell points wise, the group took many postives out of the last two-day fixture against North Sydney where the bowlers showed plenty of discipline against a determined Bears outfit. The Stags were terrific early and Logan Weston and Ryan Farrell kept grinding away nicely until Logan fell bringing Ahillen Beadle to the crease. AB showed his class and value from early in his innings as he and Farrell added a valuable 30 for the second wicket on what was proving to be a challenging wicket. Wickets fell around AB at bad times until we were bowled out for a measly 123, the deck flattening and the sun shining. It was Ryan Hadley and Aaron Beard to take the new ball with 18 overs to bowl before stumps, a few half chances created and a couple taken with the Stags falling to 2-63 at stumps on day one, Beard and Hadley one wicket a piece. Day 2 was always going to be tough to claw back, some good bowling from all of the Tahs’ bowlers didn’t prove enough with Gordon passing the first innings total 4 down, Joey Graham the pick with 2-10 from his short spell. A declaration came immediately and we were asked to bat again, this time on what was shaping to be a much better batting surface with a much quicker outfield. The openers proved this with a gutsy first wicket stand despite the Stags bowling well, before Farrell fell bringing AB to the crease once again. Despite Weston and AB sharing a strong partnership and dictating terms it unfortunately wasn’t quite enough to give the Tahs a second innings sniff. AB, however, went on to score one of the more impressive and well-constructed tons, a testament to his ability and leadership with the willow this year. We go beach to beach next week against a formidable Rany-Petes line up where hopefully we bring the few positives we’ve taken out of the last few weeks and construct a well-rounded performance. No play due to wet pitch. After a moist Friday night that got the better of a number of grounds across Sydney, LM Graham’s Reserve looked an absolute treat with the steam glistening off its damp surface. With talks of the night before, supporting the sponsors and possible Pepsi challenges quickly being put to one side, the Waratah’s honed in on the days play with the crispest of warm-ups led by Domestic T20 Superstar Michael Counsell. Remarkably, Captain McLachlan won a toss for the first time since the Cold War and the Waratah’s padded up for a morning of grind. As if like clockwork, the steadfast duo of Hole and Brewster strode to the crease looking to continue their recent form with the willow in hand. Hole began with a flurry of supremely timed 2’s (a recurring theme of the wily veterans innings), while the young dasher at the other end threatened to get going before getting the ‘ball of the century’ – a hip-high long hop that somehow found Fine Leg. Alas, the baton was passed to O’Sullivan to craft out an innings in the increasing heavy and humid conditions. With Gordon’s seam attack showing great discipline throughout the first session and a half, the Waratah’s toiled there way along at around 2.5 runs/over, before O’Sullivan began to hit his stride with a number of supremely timed flicks off his pads; a true joy to watch. From here the combination of Hole and O’Sullivan continued to increase the tempo, with the elder statesman resorting to a number of sweep shots to release pressure, and the junior simply caressing the ball magnificently all over the ground; truly marvelous stuff. With 38 overs bowled and the partnership swelling past 100, Hole was bowled attempting to hit his second grade six for a controlled 60, a return to form for one of the clubs favourite sons. From this point O’Sullivan just kept on going, finding the boundary with sumptuous ease. With only a few overs remaining, the young man brought up his first ton for the Waratah’s, to the delight of the thousands in attendance. He would finish on a sublime 116*; and with a few late cameos from Trewartha (15) and Vumbaca (12*), an imposing score of 214 was amassed. The game plan for Captain McLachlan’s men was simple; build pressure. As they have continued to do so week-after-week, Somerville and Bishop-Perrett set the tone with a display of disciplined bowling that instantly pushed the run-rate northward. With wickets tough to come by thanks to some tight batting from the Gordon openers, dot-balls were a measure of the Waratah’s success. Vumbaca’s introduction of finger-spin (formerly wrist-spin) was a critical juncture in the match, and the young Italian Stallion certainly delivered an impressive spell, culminating in the wickets of both openers just as they threatened to get going. With Gordon needing to go at 6-7+ runs/over for the last 20 overs, the pressure was always on them and the Waratahs took a steady stream of wickets to slowly close the game out. Bishop-Perrett returned to the attack and collected a cool 3/26, while the skipper cleaned up the tail to jag 3/41, the true definition of burglary. So 6 more points for the Main Grade and a 5th win on the bounce, a remarkable turn around considering we only had 2 wins from the opening 7 rounds. With the side in red-hot form and a place in the finals only a couple of wins away, the boys are itching to head out to Randwick-Petersham next weekend and keep the ball rolling! Special thanks to Alan Wright and Ted Lindsay for their ongoing help at Graham’s each and every week, along with the younger (and older!) Will’s for running drinks all afternoon! The mighty 4’s turned up to Killara Park eager to make amends for the crushing final ball defeat suffered against Sydney last weekend raring to go. Unfortunately, however, the annoying drizzle was ever-present, meaning a late start was on the cards. Several coffee runs later, the opposition combined with the vivaciously eager Jordan “Rashvest” Daly dragged the big cover off and revealed a tacky wicket with several wet patches meaning that the groundsman, sporting a unique combination of a high vis vest and a camo t-shirt (not sure what’s doing there?) needed to do some running repairs on the wicket prior to handing it over. An 11:40 start time with the loss of two overs each was established and after being sent in by the Gordon skipper, openers Cohen and Gummer strode to the crease hoping to make a solid start and set a platform for the middle order to capitalise on later on in the innings. The boys started cautiously, picking up singles and twos as well as taking advantage of the loose balls before Gummer was undone by a peach of a delivery just clipping the top of his off stump. This brought Dom Wheeler to the crease and the flatmates consolidated well; patiently waiting for bad balls, manipulating singles and seeing off the opening bowlers to great effect. The pair moved the score to 57 before Dom unfortunately feathered one behind for a gritty 17 on a tough wicket. Crombie then joined Cohen at the crease and after navigating 13 of the best balls seen on a fourth grade cricket ground/dog park he exhibited his renowned fluency and the pair found runs a little easier to pick up as the wicket flattened out, during this time Cohen managed to bring up a well-compiled 50 as the boys passed 100. The introduction of spin was a little bit of a turning point as the off spinner utilised the slow and wet outfield, a turning wicket and bowling tight areas to pick up Cohen for 67, and then tightened the screws further by dismissing Osborne, Crombie and Lucius, as well as losing Daly in this period of time. A counter attacking display was put on by Will Akhurst (28*) and a nice cameo from Joshy Seward (18) at the end allowed the Tahs to get ourselves to the very defendable total of 174. The bowling innings didn’t get off to the greatest of starts with Gordon sending out two North Queensland cowboys who threw willow from ball one getting a few quick and cheap runs. The pair whose techniques were about as compact as a Boeing 747 in landfill took advantage of some wayward bowling allowing them to move to 0/63 in 8 overs. The introduction however of Jacob ‘Bradley Cooper’ Graham and the Crom reaped rewards with both taking the wicket of an opener each with Wiggs taking an excellent catch in the deep and Lucius mitting a sharp chance behind. These breakthroughs meant that we had the chance to blow the game right open but the batting exhibited from numbers 3 and 4 was mindboggling with absolutely nothing going our way as the pair set about chasing the target through the vacant third slip and gully region playing an array of snicks and French cuts that would prove to be some of the most frustrating cricket ever to be witnessed. The two bats proved their lack of application however with Wiggs in his second spell knocking over the number three with a pearler and straight after drinks Crombie taking an excellent return catch of his own bowling. This made the equation simple; 6 wickets to claim with 50 runs to play with. This caused a huge shift in momentum as the Manly men dug deep and backed each other to fight back, taking regular wickets in the middle to late overs, pushing hard for a win late in the day (Wiggs and Gummer taking one more each) as well as Seward returning and bowling an outstanding few balls in the clutch to claim his first and his second fourth grade wickets. With Wiggs obliterating the number 10’s off stump a final wicket was required with 8 runs to spare but unfortunately the fairytale finish wasn’t to be with Gordon passing the total 9 down with 4 overs to spare at about 9:30pm – shattering. The loss was crushing as the boys did a fantastic job to pick ourselves up and wrestle back momentum after an early partnership. Again, this week an issue for us was perhaps our discipline with the ball as we sent down 20 wides, however, a fired up fourth grade side will be looking to take out our frustrations on Randy Pete’s next week back in God’s country – Graham’s Reserve. See you there. Fifth grade rocked up to Mike Pawley looking to bounce back from a rather large defeat the week before. With a late pull-out, we welcomed Toby Laughton, who was about to make his debut for the club and in grade cricket at the age of just 13! We also welcomed a new skipper in Andrew Rochford, replacing Dylan with his broken arm. With the pitch being quite soft underneath, and the overcast skies, Gordon sent us in for a stick. Unfortunately for us, most of our top order fell quickly with Barnett, Duly, Jones, and D’arcy all falling in quick succession, due to some sharp deliveries and catches, which left us at 4-20. Lachie Charles continued through, Providing some fight to our batting innings. Melville and Dunlop fell soon after, While Charles was dismissed later for an innings high of 17. The tail added a reasonable amount to the total with Rochford (12no), Laughton and Hobson all chipping in some runs. In the 30th over we were bowled out for a measly 75. Our bowling would need to be on point from ball one. Skipper Rochy and Hobson opened up, with an early wicket to Hobson in the 2nd over, the opening bat ballooning one to point. This was then followed up a few overs later with a mix up that resulted in a runout with Trewartha, Jones and Dunlop all contributing to it. Sam Jones then took 2 wickets in fairly quick succession, to have them at 4-30. However, their 5th wicket partnership took to us at the end playing some attacking shots to get the job done for them in the 22nd over. Pick of the bowlers being Sam Jones who finished with 2/13 from his 5 overs. A lot to learn from the past two rounds for 5ths, hopefully looking to turn it around next week. Manly Womens’ third grade welcomed St George-Sutherland to Keirle Park for our rounds 5 and 6 T20 double header. St George won the toss and elected to field. Manly got off to a great start with openers Mia Waddington and Izzy Keene both retiring on 30* and 31* respectively. Kristie Crawford came in, helping to keep the run rate ticking over with a quick 17. In a slow outfield, the girls picked up a lot of quick singles and boundaries were hard to come by until Mia cleared the ‘fence’ with her first big six to much celebration. Manly finished 6 for 98 off their 20 overs. St George started cautiously with good bowling by Sarah Gordon and Chelsea McLerie. Sienna James picked up the first wicket LBW and soon after Sarah Gordon took two great catches off Mia’s bowling. Continued pressure with the ball and in the field saw the run rate required start to climb for St George. Further wickets to Kristie, Renee Hough and Sarah with other notable great catches from Abby Taylor in particular and Izzy. St George finished 6 for 74 after 20 overs, a solid win for the Manly girls. After a quick afternoon tea, St George won the toss again and sent Manly in. Unfortunately, we lost Sienna early but Robyn Medley and Nat Guyot worked well together, picking off many cheeky singles which worked well until their respective run outs. Everyone else chipped in but some late hitting from Mia and Olivia Hough saw us reach 9 for 92 of 20 overs. With St George at the crease again, Chelsea picked up an early wicket. Their other opener however proved to be more stubborn and harder to remove. Further wickets came for Izzy and Kristie, but when the opener retired, the run rate required was down around 3 an over and Manly needed to take some wickets to get back in the game. The experienced St George batters, however, were not in the mood to take risks and worked the ball around as the Manly side started to tire. They were helped by significantly more sundries than the first game but still way down on the start of the season. St George passed us 3 down in the 19th over but if we only needed a couple of wickets to expose their long tail and it would have gone down to the wire. Manly’s U18 Brewer girls were playing away at Graham Reserve versus Gordon. The field looked terrific, and with a nice ocean breeze keeping the humidity down making a great day for cricket. After a resounding defeat against Gordon when we played last played them at home, the girls were keen to show what they could do. Manly lost the toss and fielded first. Manly bowled all day with a combination of pace from one end and spin from the other to try and stop the very accomplished Gordon openers from getting settled in. The strategy worked well, with Chelsea McLerie and Abbey Melville, and then Gemma Lacey and Mia Nel bowling in pairs, the Gordon batters never quite got on top. Gemma got the break through with the score on 32, picking up a nice lbw. Gemma then got another breakthrough, with a nice caught behind from Nat Guyot. From there, the wickets kept falling, with the pace bowlers getting the breakthroughs and the spinners keeping it tight from the other end. Chloe Osborne picked up 2 wickets bowling with Sienna James, and Robyn Medley picked up 2 with some tidy left arm swing bowling. Jess Mulcahy and Mia Waddington picked up the last 2 wickets. The last batter for Gordon put on a stubborn 12 runs, which would prove vital in the end. Manly started solidly with the bat, with Mia Waddington and Nat put in on 19 runs through smart running, but when Nat was bowled, the girls could not put on another partnership against a tight Gordon bowling attack. Jess fell for 4, Chloe for a quick fire 12, and was Robyn run out for 7. Still, at 4 for 60 the girls were still favourites to take the win. Unfortunately, Mia, who top scored with 22, Sienna and Hannah Woolf all fell with the score still on 60. Despite some strong late batting from Kate (11 not out) and Mia (run out for 6), the girls fell agonizingly close, all out for 83 off 37.4 overs. Despite being a disappointing loss, the girls are taking confidence that, after beating the top team Northern Districts last week, and challenging second place Gordon this week, they know that they can be competitive against any top team, and with continued hard work and learning, they are headed in the right direction.